Relief is just an arm’s reach away. Health ailments and injuries are bound to interrupt your day-to-day life when you least expect it. Home Remedies Rx offers safe and effective treatments when you them most. Whether you are battling insomnia, a headache, chapped lips, a bee sting, or acid reflux, Home Remedies Rx offers tried-and-true solutions to help alleviate everyday aches and pains, as well as tips for enhancing beauty and wellness. 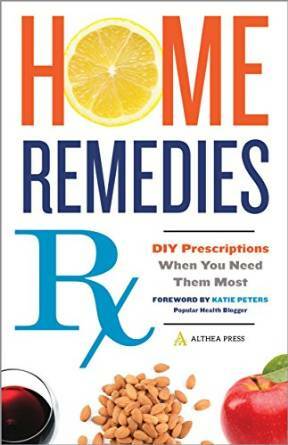 From the natural healing experts who brought you the New York Times bestseller Essential Oils for Beginners, Home Remedies Rx will help you treat today’s ailments with time-tested wisdom. Save time, money, and trips to the doctor’s office with this handy guide to home remedies. I was happy to get to read HOME REMEDIES Rx DIY Prescriptions When You Need Them Most. I really enjoyed and learned a lot from this ebook on my kindle. I have been using home remedies passed down from my grandmother since I was a little girl so I was very interested in learning some more. I found a lot of tried and true remedies that I use often on myself and my family. I learned a lot of new ones as well. It is interesting to read what nature has to offer what ales us. I like that this book is common sense as well. No hocus pocus and no silly wives tales that obviously would not work. I like this about this home remedies book. It is an easy read and uses common items that I have heard of and can easily obtain if I don't already have them in my pantry or garden.